Half-way up the long chair-lift to the top of the Pointe de Nyon (2015m) in the very-slushy French Alps, there unexpectedly stands, perched white-knuckled on the mountainside, an unusual thing: an opportunity to get off the lift. It's not much: a wooden platform with some drop nets, a hut and an icy run off so that any travellers who find themselves too cold, too tired or too fearful of the steep run and the bad weather that awaits them at the summit, may abandon ship, and join the red Aigles run just below its steepest part. Of course not many do; for what is skiing if not the pursuit of danger, the deliberate placing of oneself in risk? To travel just a little faster than is safe, to turn a just a little closer to the sheer edge, to stay out on the slopes when the daylight has faded to almost darkness and one's legs are aching-tired, and the last lift closes in seven-and-a-half minutes. That's skiing. And that's how it comes to pass that 1700m above sea-level, half-way up the Pointe de Nyon there works the Haute Savoie's loneliest chairlift operator, with seldom even a customer to break his day. 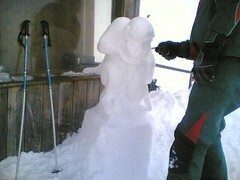 To pass the time - and no doubt to amuse the skiers - and perhaps in an effort to entice people from their seat and on to his deserted platform, this liftie spends his day building snow sculptures; wonderful sculptures, a metre or so high sculptures, fantastical figures staring out over the pisted slopes toward Morzine and Les Gets below. Like the skiers this mysterious, lonely snow-sculptor also is a risk taker, a seeker of danger: for some of his sculptures stand on the very edge of his platform, just few centimetres from the passing skiers, with their dangling skis and swinging poles, and just a dazzling few steps from the drop. All day the liftie works on his pieces, for snow sculptures take a lot of maintenance in the high, windy mountains, and new designs come frequently to mind, and as the chairs pass, one every 20 seconds the liftie darts in and out between them, frequently turning his back, the unchanging, ceaseless rhythm of the chairs second nature to him, he dodges neatly each heavy descending chair that threatens to knock him off his precarious perch and down the steep mountain below. 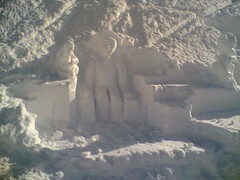 Liftie doing snow sculptures by mbiddulph. I rode the Telesiege de Nyon twice last week. On both occasions I stayed in my chair and went right to the top. Love it, eccentrics make the world a much more interesting place to be.